Falling in love is the most glorious feeling ever. The thrill of wanting to spend every waking moment with that special someone. The tingle rushing up your arm when he holds your hand for the first time. And for Bruce and I the joy didn’t end at the altar (praise the Lord!). We were married for six years before we had children. In those years we moved five times, visited three different continents, started a new company and fell more and more in love. We believed strongly in the “synergy” of marriage. How two individuals combined for greater impact than they could make separately. One impact/goal we shared was having a family. So began the Mac boy factory in 2005 with the last boy being born in 2012. Having lots of children had it’s impact, alright. Add a demanding job. . .and let’s just say “thrilling” and “synergistic” wouldn’t be words we’d use to describe our marriage anymore. We shared some of our story a few weeks ago on the podcast (Episode 38). One part of the story we didn’t share involves today’s podcast guest, Kristen Bell, our cousin. A year after our last son was born our marriage wasn’t in the best place it’s been. We hadn’t been on a trip alone in years. When we got invited to a wedding in California the weekend Bruce turned 40, we saw it as a permission slip to get away together. Part of our trip we decided to visit cousins, Rob & Kristen Bell (Rob’s mom and Bruce’s mom are sisters). I wish we had taken before & after pics from our short time together. We arrived to their home like wounded, little birds. They took us in and reminded us how to live a good life. We ate delicious food, walked the beach, enjoyed conversation and encouragement. It was the positive momentum our marriage needed. A reverse in the current cycle. I feel like this book put into words what we had experienced the last few years of our marriage. Even this past weekend, after both reading it, we used language from the book to communicate and heal some broken places in our marriage. Of course, given the fact when Rob & Kristen share stories about their own life, times we remember them going through, we relate on an even deeper level to this book. Rob shares some sweet memories of Bruce’s grandmother. . .which is a gift. But if you need a quick, easy read to remind you of your first love, to reverse the negative cycle of your marriage, give you language to communicate, to see the spiritual impact your relationship can have or as a resource to hand to a unbelieving friend. . .this is the book for you. When life happens and you’ve lost the spark between you. Remembering to go back to your original intention–“I’m here for your best”. Our deep need to have someone for us. How a disruption can be the best thing for your marriage. The art of fighting/disagreeing well–cooperative state of mind. Strengthening the bond of your marriage with shared experiences. Guarding those exclusive moments between the two of you. How we reflect the Trinity and grace through the love we share with our spouse. 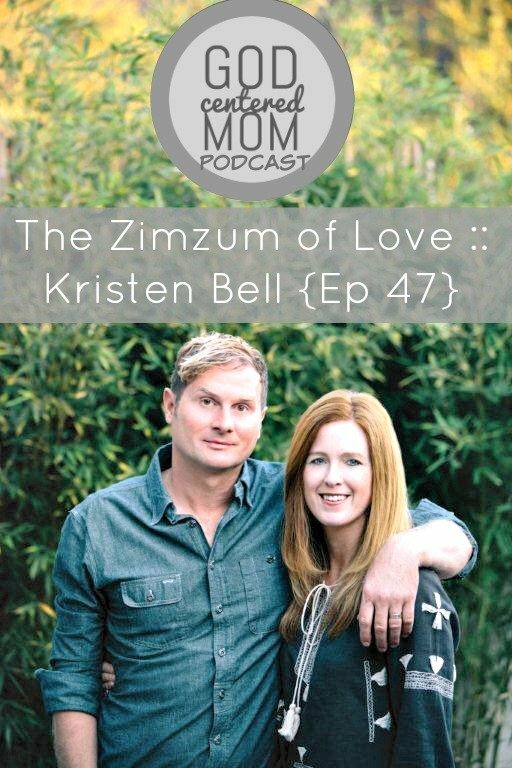 The impact of children on zimzum–how moms contract for their children. All the practical things we could do for our kids, yet the best we can do is love our spouse well. “The Zimzum of Love Book Trailer. . .
Have you ever gone through a dry season or challenging time in your marriage? What did you do to repair and reconnect?